So we found a place to live in Auckland (yes it was hard) and have managed to secure it by jumping in quickly. Just one thing I'd like to check, as coming from the UK this seems very weird. The lettings agent suggested bringing forward our moving date in order to secure the property, even though it still takes 2 weeks for the container with our belongings to arrive. We would basically be paying rent for an empty house. Now I don't have a problem with that seeing the Auckland market is hellishly competitive. However, the house still has some of the landlord's stuff in it and it still needs professional cleaning. In the UK, the house would become available when the house is ready to be "delivered" to the new tenants; in other words: empty and clean. It seems that the expectation here is that we start paying even though his stuff is still in there and the house hasn't been cleaned. Can I pressurise them to push the "moving date" forward to the day that the house will be ready for "delivery" or will I then risk losing it? have you signed a tenancy agreement? do you have a signed copy of it? what date is on the agreement for commencing of the tenancy? dan: have you signed a tenancy agreement? do you have a signed copy of it? Nope, the intention is that this should be signed this afternoon. We put the "moving in date" as today in order to secure the place. As said, no chance the place would be physically in a state of readiness for us to move in (if we did have our belongings here and were ready to go). As a landlord I would take the view that once you start playing rent the place is yours to enjoy. I don't see how you can fully enjoy the house if the landlords stuff is still on site. The reality is that you might not want to wait till the container gets here and purchase new furniture that your right. With regard to cleaning that's a subjective judgement and hard to comment on. The only thing I would say if you don't feel it is clean take photos so you have a record of the condition of the House when you move in. Also make sure that any issues are noted on the Agents pre moving in inspection as this will be taken as evidence in any future dispute. not sure why you would tell them you wanted it from today if you really wanted it in several weeks, as a landlord myself that would kinda piss me off. the tenancy agreement, and you have a copy of it. See if you can change the moving in date to the date the Landlord has it emptied and cleaned. That is a sort of compromise between what they want (a house paying it's way straight away) and want you want (a house). Unfortunately Auckland is a landlord's market. If you think you can find another within the two weeks before your container arrives, tell them you want it on your terms on no terms. dan: not sure why you would tell them you wanted it from today if you really wanted it in several weeks, as a landlord myself that would kinda piss me off. Our physical moving date is very hard to predict. 1) the shipping container will arrive within 5 days. 2) it will then take however long customs MAF/MPI take to clear the thing. On the other hand I have the moving company having a go with me for failure to supply a physical address in New Zealand, as this is required for the customs clearance which is imminent.. So yeah, tough.. Also we had 3 other people pushing for the same place. I've seen the place yesterday and indeed some work still needs to be done. I think I should just ask if we can set the date on the tenancy agreement to the date the landlord can have the property ready. Yay. Cheers guys. I will update you on the outcome. Also, if I understood correctly, there is no obligation for a tenant to pay council tax / rates ? This is a big difference in rental pricing as in the UK they are about $300 monthly - and the tenant pays. trig42: See if you can change the moving in date to the date the Landlord has it emptied and cleaned. That is a sort of compromise between what they want (a house paying it's way straight away) and want you want (a house). Unfortunately Auckland is a landlord's market. If you think you can find another within the two weeks before your container arrives, tell them you want it on your terms on no terms. Landlord pays council tax/rates. The only thing you pay is the weekly rent. 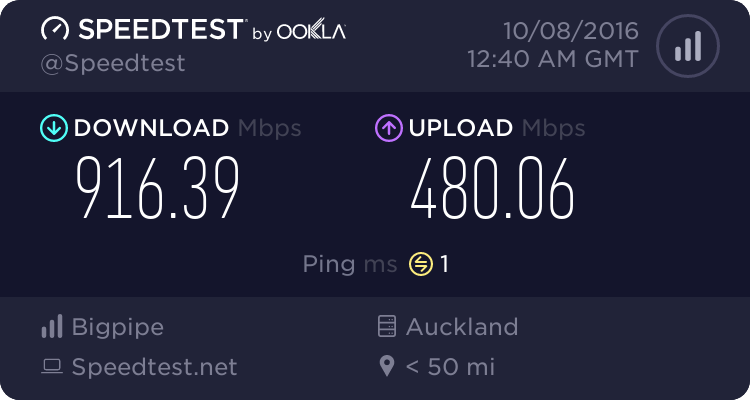 Yay for UFB being installed already, I'd recommend bigpipe.co.nz for a provider. They have plans (all unlimited) up to 200 down and 200mb up. P.S. Welcome to (or back to) NZ. rp1790: Landlord pays council tax/rates. The only thing you pay is the weekly rent. Dont forget water rates, That is typically (although not always) paid by the tenant now it seems. Also, With the UFB install, You want to be requesting that to be installed the day after you take possession of the property if you can otherwise ASAP. It may happen on time but there is still a possibility of even with the internal stuff being ready of being stuffed round by the provider provisioning the service, so dont take the risk if you can avoid it. Regarding UFB, I was planning to submit the application today (pretty much after the tenancy agreement was signed) as I know these processes can be lengthy and I want it to be in place when we move in :) Also, my intention was to go for BigPipe (naked, fast and simple). rp1790: Landlord pays council tax/rates. Not true. The property owner pays them, legally the landlord is the property manager. As someone else said - take photos; take heaps of photos of the place before you shift in. You might need them now if the landlord doesn't get their stuff out to prove it; you might want them when you shift out if there is any dispute about the condition of the property.